One man’s mission to effect change in Cuba is garnering attention at FIU. Raul Moas, executive director of Roots of Hope (Raices de Esperanza), will visit the Modesto A. Maidique Campus, Thursday, Jan. 23, to talk to students about empowering Cuban youth to become the authors of their own future. Roots of Hope is a non-governmental organization (NGO) dedicated to raising awareness about the struggles of Cubans in the island and bridging the gap between them and the Cuban diaspora. It spearheads a number of projects aimed at bringing resources and access to information on the island. The NGO also leads the campaign Tech for Cuba, which boosts the connectivity of Cuban youth by providing them with cellphones, laptops, tablets and other information technology. 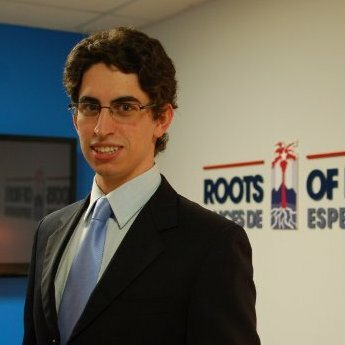 Raul Moas, executive director of Roots for Hope and Cuban Research Institute community advisory board member. Roots of Hope has an extensive student network in universities across the nation, including the University Florida, Georgetown University, Harvard University, Miami-Dade College, New York University, University of Miami and others. A new student chapter was established earlier this month at FIU and will be recognized at the talk. Moas, a Miami native of Cuban descent, also serves on the community advisory board of the FIU Cuban Research Institute. The institute encourages original research and interdisciplinary teaching; organizes activities; and promotes the development of library holdings and collections on Cuba and its diaspora. Its advisory board brings together community leaders involved in Cuba-related work to support the institute’s mission. Moas’ talk, titled “Cuba in Transition: The Role of Technology in Societal Transformation” is scheduled for 2 p.m. in the College of Business Complex (CBC) 232. It is free and open to the public and co-sponsored by the Ruth K. and Shepard Broad Distinguished Lecture Series. To RSVP, click here. I would like to see Orlando Luis Pardo invited to FIU. As I believe you may already know he is one of the most important bloggers in Cuba. Practically a male Yoani Sanchez. Incarcerated during Pope John Paul visit to Cuba. Orlando Luis has been lecturing about human rights in Cuba throughout other Univ. in the USA. What does this have to do with a university that is located in the United States of America? It has to do with the fact that a great amount of students, faculty and staff at FIU are either Cuban or of Cuban descent. The city of Miami, where the university (of which you obviously know next to nothing) is located, has also a great percentage of Cubans. Besides that, helping others in need is the right thing to do, no matter where they are from. I absolutely agree! As if the future of FIU depends on how well Cubans do in South Florida! Tammy, I’m not saying you are right or wrong in your statement. BUT, the talk and organization are for empowering Cuban youth who live IN the island of Cuba – not in South Florida. You should go back and re-read it.